What’s stopping you from selling any printer supply in your online web store? Are you confined to only using wholesalers supported by your web platform? Our recently upgraded Ink and Toner Finder, T3, lets you carry as many print supplies as you want, from any wholesaler. You can even sell your own branded supplies. When your online customers can easily find the right ink and toner supplies on their first search, everyone wins. You get fewer questions. Your customers are happier. You get more repeat orders. Our Ink and Toner Finder makes it easy for your customers to find the exact supplies they need. Without any help from you. Without extra chat sessions. Without answering email or phone calls. Without adding extra staff. Your customers check out quickly and you spend less time serving them. A good Ink and Toner Finder is like having a top-performing sales rep. The kind of associate that knows which print supply a customer needs on the first request. A salesperson that can fulfill an order even when customers aren’t quite sure what they need. T3’s data comes from the most accurate sources – printer manufacturers. Printer models and supplies are constantly refreshed. Data updates are made daily. 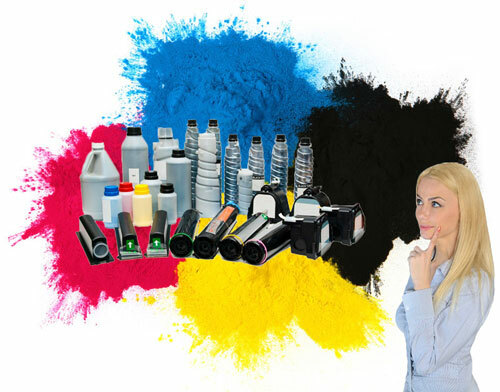 Online customers can search for ink and toner by printer or OEM supply. An autocomplete feature serves up qualified results after the first few characters are typed in. You’ll get more printer supply sales with fewer returns. √ Users can search by printer or OEM supply number. √ Autocomplete provides printer and supply options after the first few characters are typed in. √ Supply items are mapped to a master cross-reference database for complete and accurate search results. √ Automated ink and toner supply updates are sent to you nightly. √ Finder is part of your EXISTING web site. No need to switch web platforms. We can set up T3, review it and test it without disrupting your current web site. √ Prebuilt search controls you can see right now. √ Can be configured to look like your web site, including non-English sites. Components can be configured to fit into a wide range of web sites and styled to look like the rest of your online store. Setup and configuration guides are available for every component. Pricing includes setup, as well as monthly maintenance and service fees. The T3 API (Application Programming Interface) is a web interface we use to serve the data needed to create an Ink and Toner Finder. It is a programming interface which doesn’t serve any page content directly. 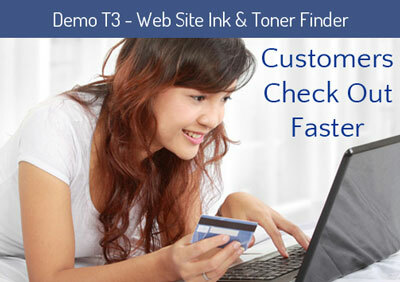 Customers using the T2 Ink and Toner Finder will continue to be supported by us. Upgrading to T3 isn’t necessary. T2 is no longer available to new clients.